U.S. President Donald Trump has “very clearly” signaled his intent to pursue a diplomatic solution to the standoff with North Korea, U.S. Defense Secretary Jim Mattis said on Oct. 3. 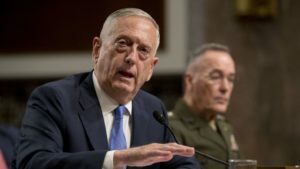 Mattis told the Senate Armed Services Committee that the Pentagon “supports fully” a diplomatic solution amid mixed messages from Washington. Trump said over the weekend that he is not interested in negotiating with the Kim Jong-Un regime over its nuclear weapons and ballistic missile programs. The president tweeted that Secretary of State Rex Tillerson is “wasting his time” trying to talk to the North Korea leader – or “Little Rocket Man” as Trump referred to him – after Tillerson acknowledged there was direct communication between the sides. “The Defense Department supports fully Secretary Tillerson’s efforts to find a diplomatic solution, but remains focused on defense of the United States and our allies,” Mattis said. He added that Trump’s guidance to both Tillerson and himself has been “very clearly” to pursue the diplomatic effort. “I do not see the divergence as strongly as some have interpreted it,” Mattis said, recalling that Tillerson had said the U.S. is “probing” for opportunities for dialogue with the North, not looking to talk immediately. Trump has said the U.S. may have no choice but to “totally destroy” North Korea if it is forced to defend itself or its allies. Pyongyang has responded with threats to test a hydrogen bomb over the Pacific Ocean and shoot down American bombers even in international air space. Mattis argued Trump demonstrated his intent to work diplomatically with other nations on the North Korea issue by dispatching Tillerson to China last week. Despite two unanimous UN resolutions sanctioning North Korea, Kim’s continuous provocations may call for still tougher sanctions, said the chairman of the U.S. Joint Chiefs of Staff. White House spokeswoman Sarah Sanders told reporters on Oct. 2 that the only conversations Washington will have with Pyongyang will be about the release of three Americans currently detained in the North.